Mesa County residents who are fed up with State Senator Ray Scott are running a campaign urging people not to re-elect him in 2018. Constituents say they’re fed up with Scott’s narrow-minded fossil fuel boosterism, ignorance of climate science, sub-par spelling and grammar and inability to tell credible research from industry-backed studies designed to reach a specific conclusion. Scott’s constituents are also offended by his rudeness. 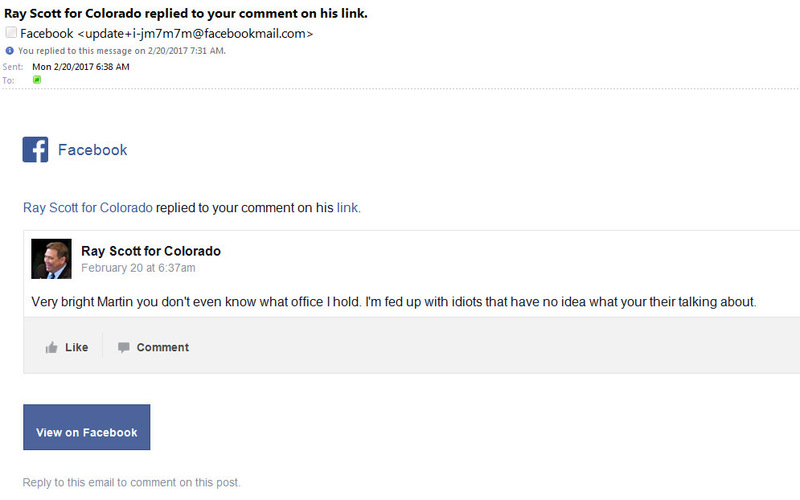 Scott calls voters who disagree with him “idiots.” In February, 2017, the Grand Junction Daily Sentinel threatened Scott with a defamation lawsuit after he called an opinion piece critical of him “fake news.” When a Mesa County resident commented on Scott’s Facebook page that the Sentinel was actually a conservative newspaper, Scott responded with this grammatically-challenged comeback: “Your [sic] a foolish Democrat, go cry somewhere else” and blocked the constituent from his page. 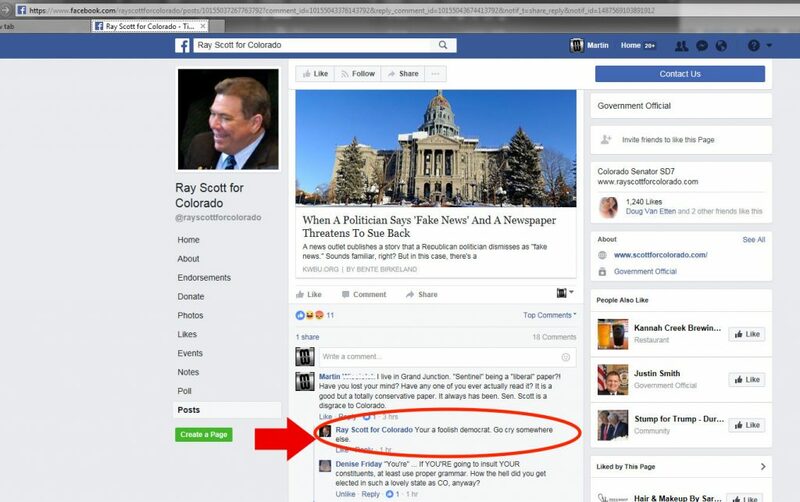 Voters filed an ethics complaint against Ray Scott with the Colorado Senate in August, 2017, after a federal court ruled that it is illegal for public officials to block users of their social media accounts because of criticism. The court ruled elected officials who block constituents from their social media forums are engaging in “viewpoint discrimination,” which violates the First Amendment. Scott identifies himself on his Facebook and Twitter accounts as a “government official,” not a private citizen, and he uses social media to discuss policy and inform constituents, yet he blocks constituents who are critical of his views. While in the legislature, Scott worked against the interests of consumers, women and children and to protect and expand the rights of wealthy developers and drillers. In 2015, Scott was the sole sponsor of SB15-091 (pdf), a bill that would have blocked homeowners’ access to the courts for construction defects in their newly-built homes. Scott’s bill aimed to shield homebuilders from being accountable for significant problems and expenses homeowners incur due to construction defects they discover just a few years after moving into a new home. Scott has also voted to kill economic assistance bills for rural communities. Scott was also the key “no” vote that killed a bill to encourage utility companies to build infrastructure across the state for electric vehicles (EVs). The bill, SB18-216, would have permitted electric companies to build more EV charging stations and recoup the costs of the construction by charging fees to users. The bill would have expanded the use of clean-running electric vehicles in Colorado by making it easier for people to charge them while traveling across the state. Tanking the bill was a goal of Americans for Prosperity, the astroturf front group funded by the billionaire Koch Brothers, whose companies refine and sell petroleum products and operate oil and gas pipelines around the country. Scott’s behavior has also raised other ethical questions over the last year as well. 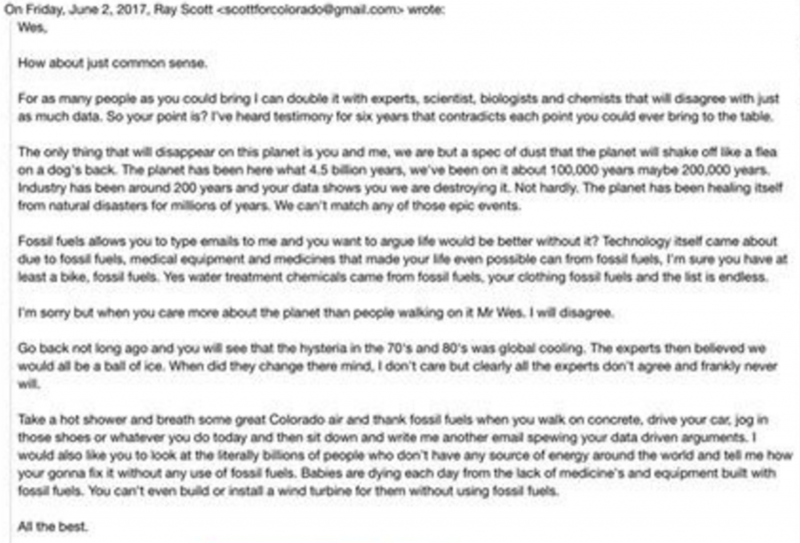 In August, 2017 the Denver Post raised the issue of emails Scott sent to his business suppliers in which he suggested he could wield his political influence in the legislature to help or harm them, and his other energy business partners. The email exchange eventually led up to a lawsuit. Anti-RayScott constituents feel Scott’s ethical lapses, his entanglement in a lawsuit, clueless statements on climate change, rudeness towards constituents and anti-consumer legislation show he is out of touch with constituents, works against their interests and is unfit to continue in office. Look for the digital billboards on Highway 6&50 in front of Sprouts, and at Colorado West Outdoor Advertising’s new digital billboard at Broadway and Power Road. If you want to contribute to the billboard campaign, contact the author of this blog. The County will start mailing out primary ballots on June 4. Election day is June 26. I can see the logic of quoting bumper stickers; there’s no way it could be traced back to you. Bernie’s just a bumper sticker. But you might want to watch those primaries. Daneros, which in English is, “Danes”. They’ll tell you it’s the hard in steel, but it’s really rad. It’s up and running, while you were watching the shiny object. Enjoy your blue ribbon castle burger. How’s that for plain English? Hard to say; is that actually you typing, or some woman you’re hiding behind? The skirts can muffle sound, you know. In other words, you haven’t a clue. But obviously you’re an authority on the acoustics of skirts. So pray tell, where do you keep your head that the sound is muffled by your skirts? Well, wherever it is, let’s just keep it downwind, which if you ever get a clue, is exactly where you wouldn’t want to be. Like I said, I can’t really take a guy seriously who makes a woman shield him from any consequences of his “bravery”. There’s a reason John Hancock ( an actual Patriot) signed the Declaration himself, in big, bold letters, rather than having someone else do it for him. He wanted his convictions to be known, no matter the cost. Sweet! You still don’t have a clue. But you can’t ever say I didn’t tell you. Yeah, no clue. Because your “subterfuge” is so effective. I’ve told you, I don’t care who the person is that can be found cowering behind some poor woman (and this can’t be an uncommon circumstance), but others might. Luckily, “no one” reads this blog. Like your disappearing act when it was time to stand up and sign your name to something? ALONG WITH YOUR MANY ASSERTIONS – YOU REPEATED SAY “HIS CONSTITUENTS”. LET’S HAVE SOME NAMES – PLEASE. Could you try that in English? Ray Scott’s constituents are the many people who pitched in to fund the billboards, and those who wanted to help but could not afford it. Suffice it to say there are plenty of them. Anne Landman is just one more tiresome liberal without a clue but is quick to tell the rest of us what to think. So, you’re in favor of politicians double-dipping at the taxpayers’ expense?